Navigating adolescence, testing your boundaries, and figuring out who you are is hard. For LGBTQ+ teens, it’s even more difficult, and potentially much more dangerous. 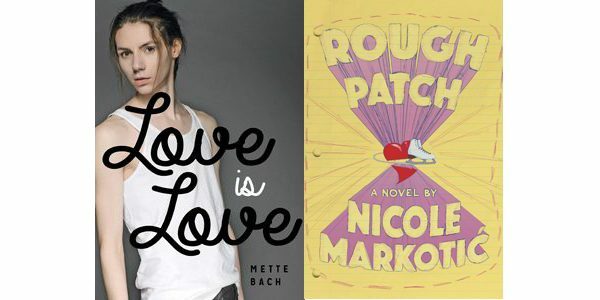 Love Is Love and Rough Patch are two books that delve into these issues. Themes of sexuality, acceptance, and the general madness of coming of age are explored in both novels, but in decidedly different ways. Both aim to capture the onslaught of various issues faced by teenagers, but the latter does so more successfully than the former. In Love Is Love, author Mette Bach tells the story of Emmy, a Winnipeg teen unhappy with her weight, her love life, and her family situation. She finds solace in two things: food and writing poetry. Following an intimate encounter with a popular classmate and a fight with her mother, Emmy is sent to live with her deceased father’s family in Vancouver. As in Winnipeg, Emmy feels unattractive and out of place in her new city, especially compared to Paige, her slender, social butterfly of a cousin, and Paige’s coterie of conventionally attractive friends. When Emmy meets Jude, her cool cousin’s even cooler transgender friend, sparks fly, and Emmy begins to realize that not only is she worthy of love and respect, she deserves both on her own terms. Rough Patch is poet, author, and University of Windsor creative writing professor Nicole Markotić’s exploration of adolescent sexuality and acceptance. After a summer away from home, devoted figure skater Keira has realized she is bisexual, and struggles with how to explain this to her boy-crazy best friend. She is also fighting to balance family responsibilities, school, skating, work, and a budding romance with a girl named Jayne. All these factors come together in a shocking climax, leaving Keira’s life forever changed. Rough Patch is written in a first-person, confessional style. Keira worries about her feelings of attraction to both genders, gets angry at the casual racism directed toward her best friend (who is of South Asian descent), and chafes under her mom’s strict rules. The informal, diary-like style allows the reader to seamlessly enter Keira’s thoughts and experience things from her perspective. Markotić, a disability studies scholar, also deftly integrates awareness of disability via the character of Keira’s little sister, Sammie, who uses a wheelchair. Love Is Love, which is told in a more traditional, third-person narration, is part of Lorimer’s Real Love series for reluctant readers, and thus aims to explore complex topics using a simpler vocabulary and writing style. This is no easy task, but Bach has made a valiant effort. While the book is highly effective in showing the importance of accepting difference in gender, relationships, and body types on a societal level, and the damage inflicted upon those who do not conform to expectations, at times the book reads like a laundry list of buzzwords (such as transphobia, fatphobia, body image). And while Love Is Love touches upon the potential violence faced by LGBTQ+ teens, Rough Patch deals with the issue and its heart-breaking consequences in a more in-depth, realistic manner. The difference between the two books is most striking in their endings. Love Is Love ends with a happy resolution; all the negative, unpleasant things that happened previously seem to evaporate because the main character has found love, and all is well in the world. This rings false, especially in the context of a character embracing the realities of adulthood. The ending of Rough Patch, by contrast, lends authenticity. While the novel ends on an uplifting note, there is no perfect, happy resolution. Some of the loose ends remain untied, but the reader is left with the impression that Keira will be able to deal with what comes next. While both novels succeed in showing how LGBTQ+ issues are everyone’s issues, Love Is Love hits the right points for its target audience and is best suited to struggling readers or English-language learners. Rough Patch has a much more adult feel, and would be a good choice for more advanced readers, particularly those with a burgeoning interest in social-justice issues.